Hagia Sophia has been badly damaged by earthquakes, fires and vandalism during the centuries. It has had 3 major changes; originally it was built as a church in 537 later it was converted to the mosque in 1453 with the fall of Constantinople and finally it was opened as a Museum in 1935. Sultan Abdulmecid ordered the first restoration of Hagia Sophia in 1847. Columns were straightened, dome and vaults were consolidated, old chandeliers were replaced by new pendants ones, huge circular framed discs were hung on columns and interior and exterior decorations were revised by 800 workers in 8 years. After all these renovations, Minaretes, Mimbar and Mihrab were also renovated and repaired 1 year later in 1850. Hagia Sophia’s copper roof had cracks therefore dome was repaired in between 1997-2002. 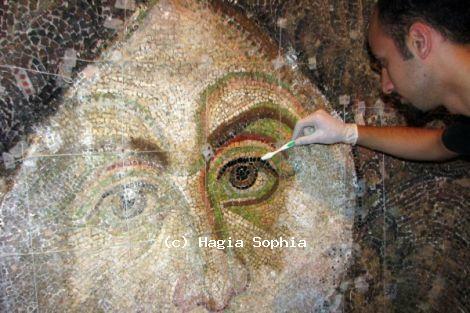 Hagia Sophia is decorated with mosaics date back 4th century. Significant part of the mosaics has been survived through the centuries because of covering with plaster during the subsequent use of Hagia Sophia as a Mosque. After many years of restorations work was completed, all ornaments and interior marble pieces cleaned and renovated again during the restoration process in 2012. A total of 600 m2 mosaics have been restored together with Islamic calligraphy on the walls. There are still visible stains in some areas of Hagia Sophia because of humidity of Istanbul. Probably the complete restoration will be impossible.